Neighbors is the Weekly’s new series that profiles ordinary people with extraordinary stories to tell. Think we should profile someone you know? Send your pitches to editor@southsideweekly.com. 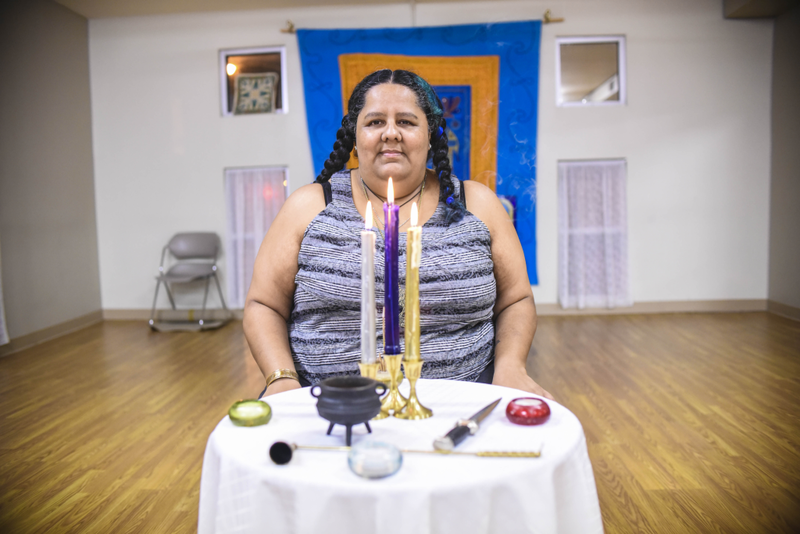 Laura Gonzalez, a forty-two-year-old native of Mexico City, welcomed me into her home last Sunday to talk about her life as a witch, a Wiccan, and, most broadly, a Pagan. We lit incense upon settling into her kitchen, to calm the air in advance of our conversation. As I waited, I caught the eye of the Hindu god Ganesh in the corner, enshrined on top of a refrigerator. I switched my glance and noticed a whimsical broom guarding a doorway. An open terrarium sat behind me with a turtle basking in the heat lamp, limbs fully extended, unthreatened, and taking it all in. “But you do jump over them!” I quipped. Gonzalez was raised Catholic, and was the most devout among her family members. Aspects of Pagan ritual surrounded her in the Aztec traditions of her native Mexico. By age sixteen, Gonzalez tore her way through books on the occult, extrasensory perception, and the like. A sense of teenage rebellion caught fire as well, characterizing her departure from the Catholic Church. It took almost twenty years for Gonzalez to find the Wiccan church. In the meantime, she experimented with reading Spanish cards, a less complex version of the tarot cards she now reads for a living. In her early twenties, she followed family ties to Illinois, living in the western suburb of Bensenville before settling in Bridgeport with her husband about fourteen years ago. Since then, she’s been actively involved in Chicago’s Pagan communities as both an educator and a proprietor. She holds diplomas in tarotology with a focus in Jungian archetypes from a small private school called Saber and Sanar in Chihuahua, Mexico, run by psychologist Christian Ortiz. Her services as a witch are extensive, ranging from tarot readings to teaching classes on Wicca to providing assistance in the performance of prayers and other magic. “I’m a witch for hire. I don’t have a ‘day job;’ my day job is being a witch,” Gonzalez said. Her work with the Center of the Elemental Spirit reflects that desire to heal and guide others. 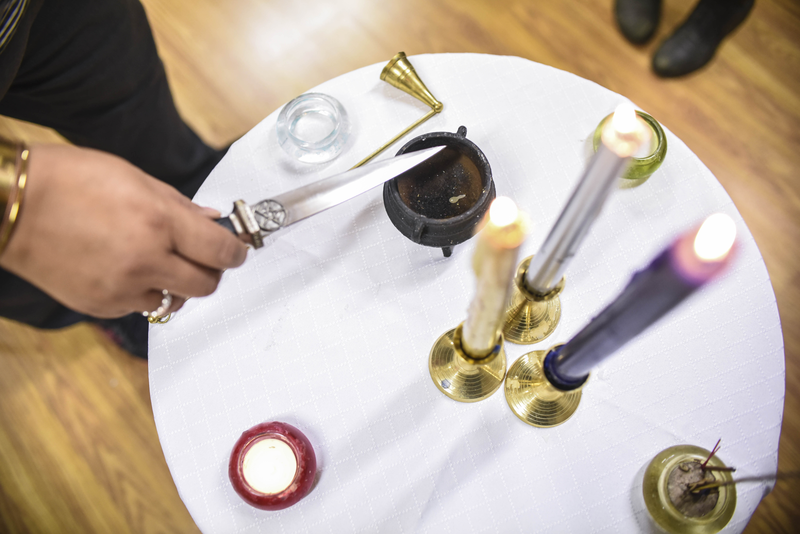 The Center is the only Wiccan congregation open to the public—most others are covens where membership is invitation-only. The Center provides a place where anyone can learn about Wicca, be they students of religious studies, reporters, practicing Pagans, or people exploring their own spirituality, known as “seekers” in Wiccan circles. To date, the group has about 300 members on paper, but the core group consists of fifteen to twenty regulars. Gonzalez considers her role as a witch in Chicago unique, in that she must contend with the advancements of a post-industrial world where the traditions of witchcraft, including apothecary arts, midwifery, and farming, are in some ways obsolete. But even as a city witch, she still keeps a broom above her doorway. “I can still go to Jewel and buy lettuce. But we’re trying to use that mythology and mysticism and practice and tradition to intertwine it into our lives,” she says of witches in the city. She is a amazing person and has tremendous support. Thanks so much Ed, it’s true, without my husband, mentors, colleagues, friends and community I simply couldn’t do ANY of all these amazing activities I’m so passionate about.